It was announced this afternoon (Wednesday) that Switch In Time, the sire revered as the king of north-western NSW breeding, had been put down in the morning at his new home near Toowoomba after a prolonged bout of pneumonia. Switch In Time had been acquired from the Marheines of Stratheden Stud,Tamworth twelve months earlier following fertility problems. Imported to NSW by prominent breeder Fred Pesiah, this 1983 Irish bred American sprinter had spent all his stud career through to the end of 2001 at Stratheden, initially with John and Kay Park and then with the Marheines. To date he has been represented by 349 winners of 1660 races and $14.4million. 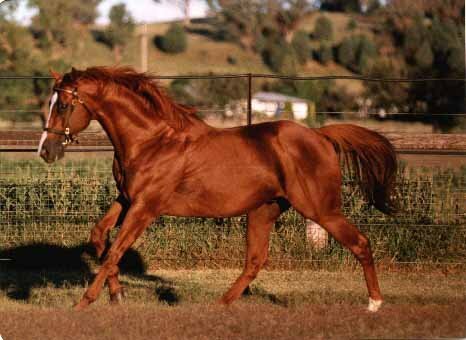 In the process he has been overall the most successful sire numerically for NSW for the past seven years. He has had winners of over 100 races and $1million in each of those years and in 1996-97 supplied winners of 220 races, a record for a NSW sire and a feat surpassed possibly by only one other sire in world racing history, Queensland's Celestial Dancer. Like Switch In Time, a representative of America's celebrated Native Dancer male line, Celestial Dancer had a world record 239 progeny wins in1995-96 and 234 the following year. There have been few tougher or sounder racehorses around in recent years than the stock of Switch In Tiime. He has had a least 50 metropolitan winners and a spectacular 39 who have each won ten or more races. One of these, the Tamworth trained Steelswitch, won 34 times and others have included Supertime Park (19 wins), Single Switch (18), County Switch, Minstinquett and Plenty To Go (16 wins each). Many of Switch In Time's best progeny, including Group 1 SAJC Goodwood Handicap winner Sword (12 wins all told), were sold through the Tamworth yearling sales.